Most of us hate meetings: They’re boring, long, and chew up your workday. And it’s even worse when everyone leaves a meeting with different memories of what was said, forcing another meeting. Microsoft’s OneNote can help solve that problem by finding who said what when, and fast. My meetings are a special case: If someone says something newsworthy, I not only have to be paying attention, I have to be on the ball to record what she’s saying accurately and in the proper context. OneNote 2013 is one of my secret weapons. 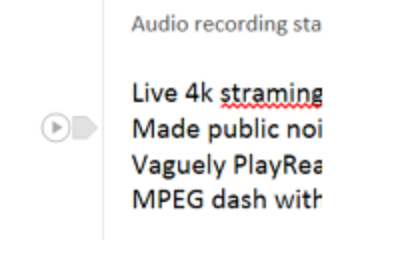 Sure, I can record audio of an hour-long meeting, and jot down notes at the same time. But I then have to scrub through the recording to double-check the quotation. That’s a huge pain. With OneNote’s Record Audio feature, the notes I take are automatically synced to the audio recording, cutting my processing time immensely. While journalists may be afforded slightly more latitude to record phone calls and conversations in the course of their work, recording a conversation falls under the federal “wiretap” laws, and may in fact be illegal without the explicit consent of the others in the room. Thirty-eight “one-party consent” states allow you to record conversations at will. But two-party consent states (California, Connecticut, Florida, Illinois, Maryland, Massachusetts, Montana, New Hampshire, Pennsylvania and Washington) require you to either ask for explicit permission or at least inform the others that you’re recording. First, ensure you’re working with the desktop version of OneNote: OneNote 2013 (or OneNote 2016, later this year). On a tablet like the Surface Pro 3, clicking the stylus launches the Metro/Modern version of OneNote, which lacks the Record Audio feature. You can change this: In Settings > Advanced, check the box marked "Make OneNote 2013 (desktop) the default OneNote application for OneNote links, notes, and clips." Next, select the Audio and Video portion of the settings. Chances are your meetings are conducted live and in person, or over the phone, so you’ll need to make sure that your audio setting is set to your computer’s built-in microphone, not your headset mic. (If you use a docking station with a built-in mic, don’t use that, either.) Don’t worry too much about the dozens of audio quality settings just yet. Enabling Record Audio is simple enough: Open a new note, title it, then click the Insert tab from the menu. When you’re ready to begin, click the Record Audio button and begin taking notes. OneNote will create a little headphones icon, and you’ll begin to see the counter at the top of the screen count up. When you’re done recording, press Stop. Once a recording is completed, you can’t add on; you’ll need to begin another file. At this point, you need to do some audio testing. I have a company-issued Lenovo Thinkpad Twist with an absolutely lousy mic, which turns any audio recording into aural garbage. The Surface Pro 3, on the other hand, records wonderfully. Have a coworker tell you about her day for a minute while you take notes, then play it back by pressing Play up above. Make sure that the “See Playback” button is highlighted. Hover your mouse over notes you’ve taken while you recorded the audio. If you do, you’ll see the tiny “play” icon. Click it to advance the audio to just before the time when you took the note. Here’s where the magic happens. 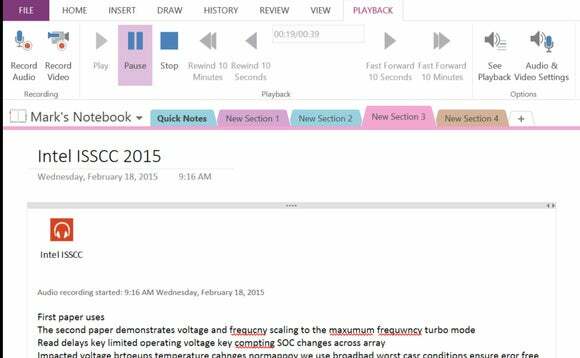 As the audio plays, OneNote will highlight your text notes and illustrations. Note the little “Play” icons that appear to the left of the text. Those little icons are the key: If you pause the audio, you can press the icon to jump to the time in the recording when you entered the note. (By default, the audio recording backs up five seconds before this.) Bingo! You now have an even more exact copy of your notes. 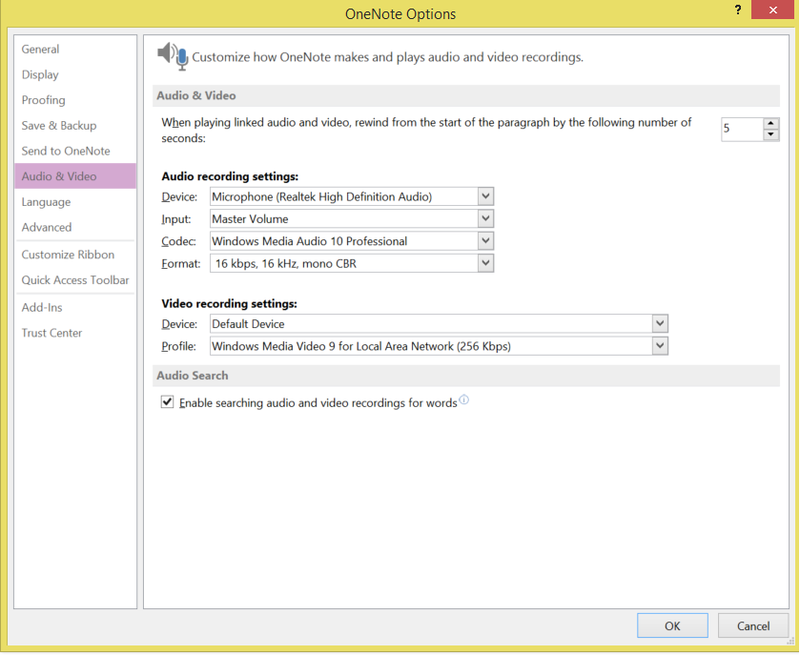 OneNote allows you to use the search bar to search for words in the recorded audio as well, by checking the appropriate box in the Audio and Video settings. I haven’t had great luck with that. I record audio in rather low quality, however, as I tend to use a given interview as the basis for just one or two stories, then move on. Note that you can also record video using OneNote, syncing your notes as with audio. The problem, of course, is that you need to be conscious of what the rear camera is pointing at as you’re typing. On most PCs, the rear camera is an afterthought; on the new Surface 3, however, Microsoft included an 8MP camera. That additional resolution is probably enough to capture a lecturer scrawling formulas on a blackboard, for example, even from a distance away. Whether you record audio or video, however, you can rest easy knowing exactly what was said in that meeting—no matter what your coworkers claim was said the next day.